Teacup pigs are amongst the cutest animals on this earth. They generally don’t like the feel of water during spring and winter season but would love it during hot days. These animals don’t like slippery floor because of their discomfort in walking. Pigs have little legs having a stumpy appearance. You can gradually start giving a bath to your pigs to avoid any negative experiences. If using the bathroom, cover the floor with nonskid rugs to avoid slipperiness. It depends on the owner to give a comfort level to the pig to make them feel comfortable in the bathroom. It could be a kind of special treat to the pig. 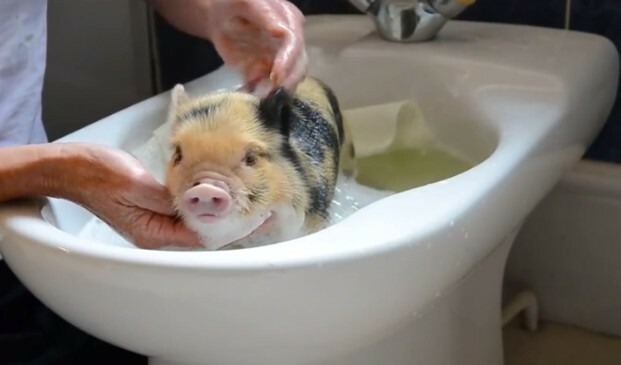 There could be special tricks taught to the young teacup pig to show them that bathrooms can be fun places for them. When you’re at the point of giving a bath to a newborn or young pig, turn on the taps to make them comfortable with the feel and sound of running water. Turn the tap on and off a few times to check the reaction of your pig. This is to make the small pig comfortable with water and make them realize that it is nothing to be afraid of. You can use a bathtub for bathing your pig and it is even easier to do it with a shower. You can even use food to bring them closer to a bath. Once the baby pig gets happy, gradually put water on it and clean their body. The depth of water on each training session can be increased. There should be the perfect temperature of water used for bathing your little pet as they won’t like it too hot or cold. Your pig will soon start getting the commands and your tender touch will lead them towards a habit of getting water on the body. You need to reassure that your pig is not frightened and a good parent would take care of the same. After finishing the bathing process, you can use a towel for your pig to give them a massage. It would give them all the comfort and the piglet would become pleasured in its own way. You can even use some toys in the bath to make them excited about their bath. The bath towel has to be soft and not too small to make them dry and roll about in their own way. You can make a great bath-time experience for your little pet and the entire process will become easier with time. Teacup pigs are easily trainable and your pig will start trusting and loving you within a short span. These animals are intelligent and bathing won’t become a problem for you in any way. There are special pet shampoos and cleansers meant for the pigs and their veterinary doctor will provide you will all the necessary information. They don’t have fur on the body and hair on the skin makes them easily manageable. So, think about your own ways to make your baby pig comfortable and assure them of having a great bath in your company.